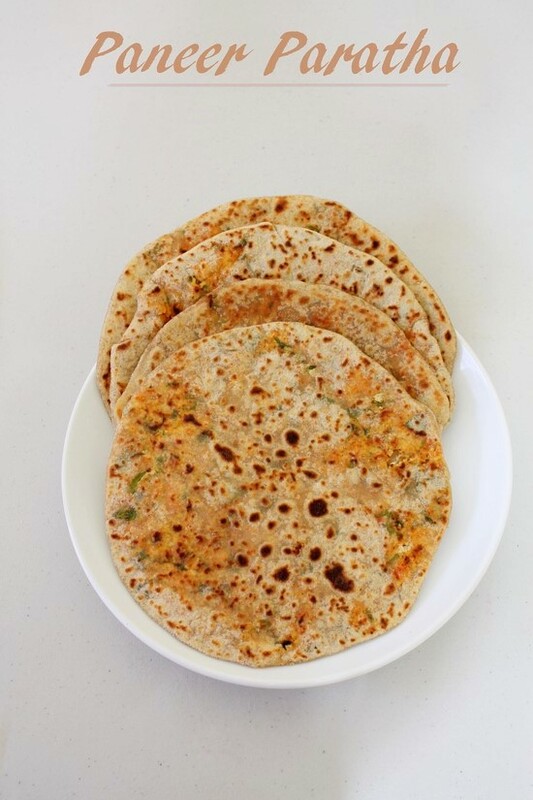 Paneer Paratha Recipe – whole wheat flat bread stuffed with crumbled, spiced cottage cheese and then shallow fried with oil. This is punjabi paneer paratha. This is very quick to make if you are using store bought paneer or you have made paneer at home ahead of time. 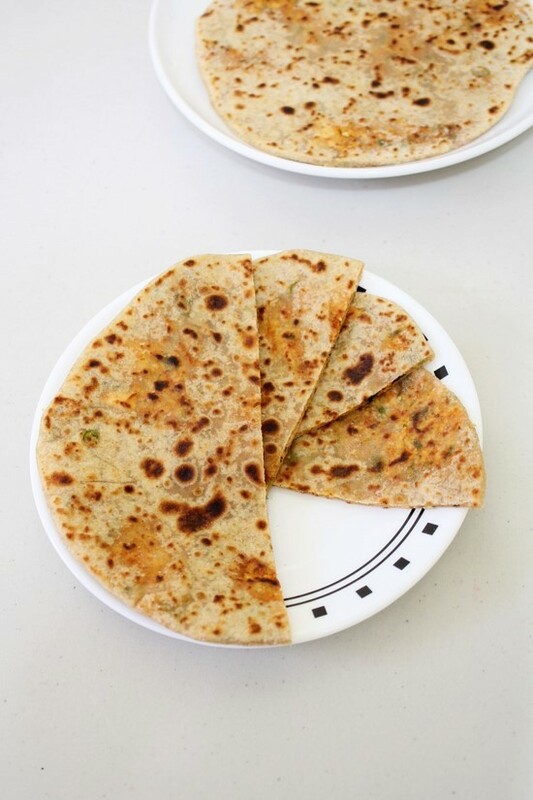 Any kind of stuffed paratha is our family favorite. It makes perfect dinner with yogurt which dear hubby loves the most. Also it is easy and convenient for me to make dinner after full time job. I usually make dough into food processor which requires no time. Then stuffing gets ready in few minutes. And then rolling and frying paratha takes 15-20 minutes for 2 of us as I have enough practice and speed so I can roll and fry paratha simultaneously. Thus dinner gets ready in 30 minutes. This paneer paratha I made is on heavier side, because I have generously stuffed with paneer filling as per husband’s request. You can stuff less or more as per your liking. 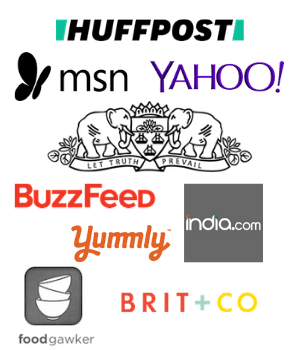 I would say, stuff generously if having alone with pickle or yogurt and stuff less if serving with curry or dal. 1) To Make stuffing, take all the stuffing ingredients in a bowl (paneer, chopped green chili, coriander leaves, salt, red chili powder, amchur powder, garam masala, chaat masala and kasoori methi). 2) Mix well till everything is incorporated well. Divide into 6 equal portions and keep it aside. 3) To make dough or outer layer, take atta, salt and oil in a bowl. Mix oil and salt well into atta using your fingertips. 4) Then add little water at a time and start kneading the dough. 5) Knead it till it gets smooth and soft. Cover the dough and let it rest for at least 15 minutes. 6) After resting time, knead the dough once again and divide it into 6 equal portions. Make smooth ball and flatten it out between your palm. 7) Work with one disc at a time. dip into atta and start rolling using rolling pin and board. 8) Make 4 inch diameter circle. 9) Put the one portion of stuffing in the center. 10) Start gathering the edges using hand. 11) Then pinch it into the center to seal it tightly. 12) Using your hand, flatten it out. 13) Dust with atta again. 14) Roll again gently into 6 inch diameter circle. 15) Once you have couple of paratha rolled out, heat the tawa or pan on medium heat. Once you have practice then you can roll and fry together. Once tawa is hot, place the paratha on it and cook for few seconds, you will see few bubbles on top. 16) Flip the paratha, apply some oil on it. While you apply the oil, other side is also cooked. 17) Flip it and cook oiled side by pressing lightly with spatula. 18) Again apply oil, flip and cook by pressing to cook second oiled side. Paratha is ready, keep into insulated container or serve directly into plate. Serving suggestion: Serve with pickle or yogurt or chutney as a breakfast or light meal. You can serve with curry or dal as a full meal. make sure that your paneer has not too much moisture. If using frozen paneer like me then bring it to room temperature before making paratha. If used semi frozen then it leaves water as it defrost, and you will have hard time to roll paratha. If using fresh homemade paneer then make sure that you let it drain well. The consistency of dough should be right and soft. If dough is hard then it will break while rolling. If it is too soft then you are not able to roll it properly. So keep this in mind. Take atta, salt and oil in a bowl. mix well and start adding little water at a time and knead into soft and smooth dough. Now Take all the stuffing ingredients in a bowl. Mix well and divide into 6 equal portion and keep it aside. Again knead the dough to smooth it out and divide it into 8 equal portion. make smooth ball and flatten it out. Take one flatten ball, roll into 3-4 inch diameter circle. Put the stuffing inside and seal it by gathering the edges into the center. Flatten it using hand and roll into 6 inch diameter circle. Use fry flour to make rolling easy. Heat the tawa to fry the paratha. Paratha’s turned out to be super tasty. Thank you for this great recipe !! I mixed the stuffing ingredients with the wheat flour and made dough to save time. Surprisingly, the dough wasn’t sticky. Great idea of adding paneer into the dough. Wonderful recipe .Thanks a ton! ! Very good and informative post..pictures are beautiful.. i needed this recipe..
Paneer paratha was delicious. My family loved it. Thanks for the recipe. Nice to know that paratha came out good.